This great 1952 serial, now an edited and digitally enhanced movie, is the story of George Wallace as Commando Cody, ‘Sky Marshal of the Universe,’ a civilian researcher and the owner of Cody Laboratories which has a sizable staff of employees. He works with American scientists Joan Gilbert and Ted Richards in the development of a rocket-powered flying suit and a rocket to the Moon. When the US finds itself under attack by a mysterious power that wipes out military bases and industrial complexes, government security chief Henderson suspects it’s an “atomic ray” originating from the Moon! He assigns Commando Cody with his secret flying suit to investigate the source of the atomic ray. 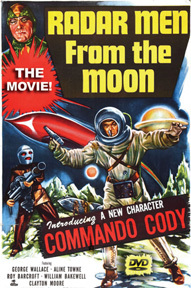 Cody, Joan and Ted take off in a rocket to the moon and, upon arrival, Cody is captured by Moon-men. They confront the moon’s dictator Retik, who boldly announces plans to conquer our planet and move his subjects there. Cody escapes from Retik and the Moon and is soon battling a lunar native named Krog and the gang of human crooks he has hired to steal and stockpile supplies for the invasion. Cody continues making trips in his experimental rocket back to the moon, in a perilous and all but single-handed effort to thwart the planned invasion of Earth. It's great Tesla technology in action and one of the first movies to investigate the concept that the moon is "inhabited." RADAR MEN FROM THE MOON: THE MOVIE! Introducing Commando Cody! 108 Minutes. DVD in Box. Trailers and other Extras. Plays in all regions of the World, like all of our DVDs.